SAWO steam generators combine a superior level of know-how with the latest technology. SAWO steam generators offer modern design and first class materials. The new STP steam generator is a very powerful and reliable steam unit. Its body is made of stainless steel sheet inside and outside providing long lasting strength and durability. Available with temperature sensor (with sensor cover), snap-in connection control unit and autodrain. The largest supplier of steam generators and sauna heaters in Australia, SAWO are now in Queensland. Gold Coast Saunas can provide a free quote to service your current steam room or build a new steam room. From hotels, resorts, commercial clubs, gymnasiums and prestige hospitality locations through to private residence and boutique installations, Gold Coast Saunas has the experience and reputation you can depend on. 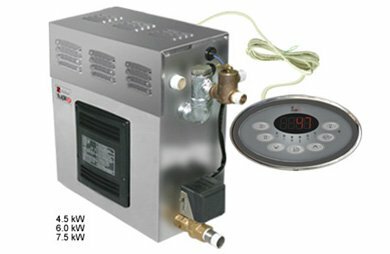 This SAWO STP Steam Generator with 3 heating elements is ideal for medium size steam rooms. It is available in a 3-Phase power supply or 1-Phase convertible to 3-Phase connection. It means that it can be used for residential or commercial purposes or with higher or different power supply requirements. 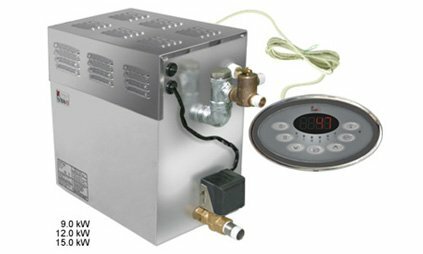 This SAWO STP Steam Generator with 6 heating elements is ideal for large steam rooms. The 9 kW is available either 3-Phase or 1-Phase convertible to 3-Phase connection. These steam generators are ideal for heavy use steam rooms.